This utterly charming “penthouse” on the third/top floor of a pale mint green townhouse at 262 East 7th Street has the good fortune of being on one of the neighborhood’s most beloved blocks. 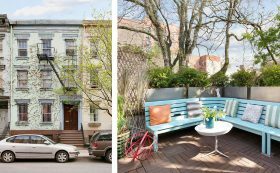 This particular corner of Alphabet City–across from the Gaudi-esque Flowerbox Building condo and home to a landmarked row of rare historic townhomes–is one those New York City secrets hidden in plain sight. Asking $1.35 million, this two-bedroom co-op doesn’t skimp on modern style or comfort. And there’s the added bonus of a lovely private terrace.